Tom Cruise as a spy gone crazy? I totally buy it. From all outward appearances, Cruise has spent the past few years casually dismantling his carefully constructed public persona. On screen, he projects a very strong sense of forceful personality — that million dollar smile, that finely-honed body, that polite and righteous self-confidence — to the extent that it’s been difficult to buy him as a fictional character. As he approaches his 48th birthday, it’s tempting to dismiss him out of hand. But he tries awfully hard to project the travails of Roy Miller, discredited FBI agent, in James Mangold’s Knight and Day. If he and Cameron Diaz, who plays the bewilderingly dumb garage owner June Havens, cannot completely shed their baggage as “Movie Stars” more than actors, it seems churlish not to credit their efforts. 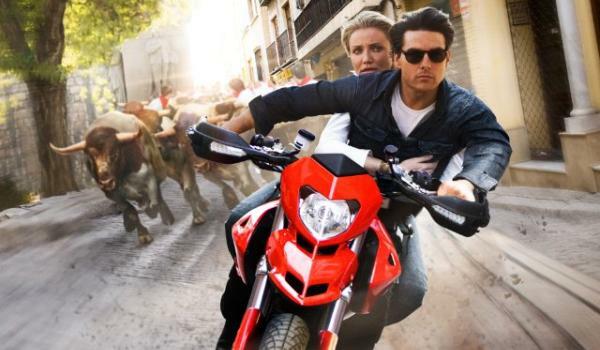 Uneven as it is, Knight and Day proves to be fairly entertaining. It’s a long, strange trip to arrive at that destination, however. Under the direction of Mangold, working from a script credited to Patrick O’Neill, the film starts in one direction, as a dark comedy, before lurching back to romantic drama territory, and then proceeding in another, only somewhat-related direction entirely. It may be intended to keep the audience on its toes, or to reflect the increasingly confused perspective of the hapless June; much of the time, though, one is left to stare at the screen in puzzlement. The action sequences look as though they were made up on the fly on the day of filming. CGI is meant to cover a multitude of sins, but it can’t create tension or excitement all on its own. So a plane crash in a wheat field — and, later, a vehicular chase through the streets of a European city — are an odd mix of video game footage and whiplash narrative. Are we meant to accept these scenes are live-action cartoons, not to be taken seriously (as in, say, The A-Team)? If so, should the rest of the narrative be taken tongue-in-cheek as well? The first part of the film sets up Cruise as Roy Miller, an agent that the FBI says has gone rogue. He acts like a crazy person — no offense to the mentally challenged intended — when he and Diaz “meet cute” by slamming bodies in an airport in Wichita, Kansas. They end up on a small commercial jet headed to Boston, where we expect Cruise to start jumping on the seats in excitement. Instead, everyone on the plane ends up dead, save our stars, and they crash land in the aforementioned wheat field. Cruise gives Diaz specific instructions on dealing with the people who are out to get him, which she promptly ignores. And the rest of the film consists of a series of episodes in which Diaz screeches and screams, and Cruise is polite and professional and proficient in every imaginable weapon and method of murder. As breezy summer entertainment, Knight and Day motors along at a good clip. Under closer investigation, the plot and the characters begin to break down. Cruise as a crazy guy / super secret spy is believable, but Cruise as some other kind of character (developed later in the film) doesn’t fit as well. More frustrating, Diaz is so blithely lacking in good sense that she inspires a fair degree of talking back to the screen (not that I would ever do such a thing in public). Director Mangold has been defiantly uneven in his career, faring better with drama (Heavy, Cop Land, Girl, Interrupted, Walk the Line) than comedy (Kate & Leopold). He adds some pleasant flourishes — notably montages shot from the POV of a drugged June — and makes the more dramatic moments involving, though the snap and crackle of comic timing is sometimes elusive. Knight and Day is more than an ambitious failure, but falls short as an action / comedy / thriller. It succeeds in fits and starts, but is highly dependent upon the viewer’s affection for / tolerance of Cruise and Diaz as somewhat aging old-time movie stars in a new-fangled world.